One of the top flamenco guitarists in the world (according to Guitar Player magazine), Juan Martín will be at The Apex on 8 June with his Flamenco Trio and their new show ‘Fire and Passion’. Juan Martin is at the vanguard of modern flamenco, with a unique style of music that succeeds in embracing classical, jazz and modern harmonies while upholding the great flamenco tradition. The guitar creates an explosion of energy and passion that finds expression through raw and dazzling displays of footwork and ‘palmas’. ‘He has a terrifyingly good technique and an absolute dominante of the guitar filling the concert hall with crystalline clarity’ El Mundo. Juan’s new dancer is the 18 year old star from Cádiz, Raquel Gonzalez. Her tremendous footwork and passion, joined with the extraordinary singing of Antonio Aparecida, and the poetry and emotion of one of the world’s leading guitarists, make for a breathtaking and passionate performance. Having learnt his art in the land of its origin, Andalucia in Southern Spain, Juan Martin has performed for Picasso’s 90th birthday celebrations, played with the Royal Philharmonic Orchestra, Miles Davis and the Nash Ensemble and performed in festivals from Montreux Jazz to Hong Kong Arts. Juan Martín is “A giant of the flamenco guitar tradition” (The Times) and “The leading flamenco guitarist of his generation” (The Guardian). Juan Martín Flamenco Trio will be at The Apex on Thursday 8 June at 7.30pm. Tickets are £18, with £5 tickets for those aged under 25. 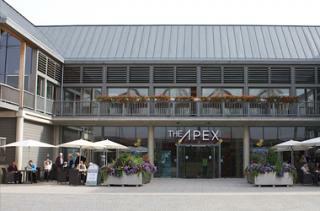 Ring the Box Office on 01284 758000, or visit www.theapex.co.uk for more information, or to book your tickets.